Good evening :) Today, I have a vitamin that is good for both kids and adults. 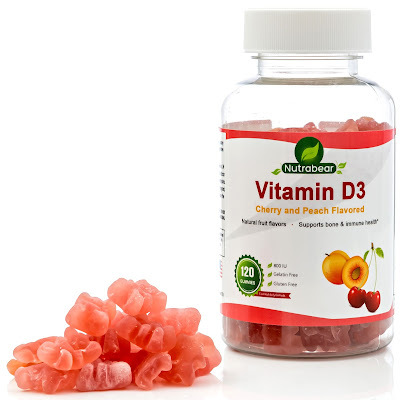 NutraBear's Vitamin D Vitamins! The bottle contains 120 gummy bears. They are flavored with natural Peach and Cherry flavors. They are 100% vegetarian. They contain no gelatin, or gluten. The vitamins contain no milk, egg, soy or peanuts. Ingredients include- Sugar Cane, Natural Flavors & Colors, Water, Glucose Syrup, Citric Pectin, Citric Acid, Sodium Citrate and Adipic Acid. I prefer these gummies over swallowing a pill. The are easy to chew and they don't get stuck in my teeth. They have a great flavor. Very tasty. It's like eating a healthy candy. Which makes it easy to feed to my son. Who also loves these vitamins. I have been taking them for a month now and I notice that my nails are growing like weeds! Most of the time, when I take a vitamin, my nails are brittle. But, thanks to these my nails look healthy and they're strong.